A Turing machine is theoretical computer consisting of a finite set of internal states, a finite alphabet that includes a blank symbol, and a finite set of instructions. It has a physical head and a physical infinitely long tape, which is divided into cells. The cell values consist of the alphabet. The tape has a finite number of non-blank cells. The head can read and write to the cells and move the tape one cell to the left and one cell to the right. 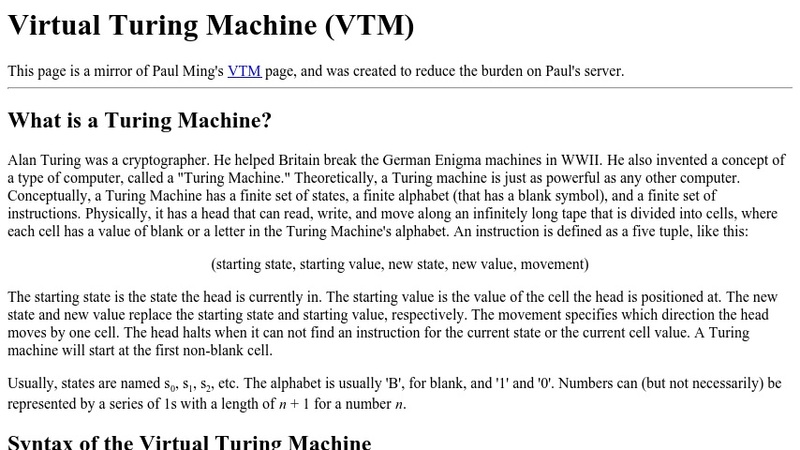 The Virtual Turing Machine lets you input tape values and an instruction set to see the output of a turing machine.